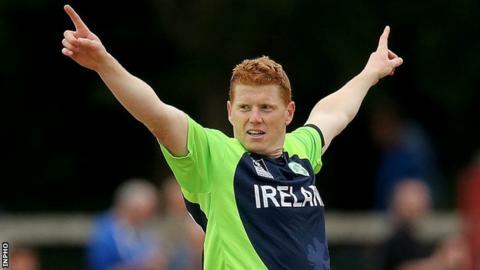 Fit-again Kevin O'Brien returns to the Ireland squad for next month's tour of Zimbabwe and Namibia. All-rounder O'Brien missed Ireland's defeat by Australia three weeks ago because of a hamstring injury. On Wednesday, it was announced O'Brien will again play for Leicestershire in T20 and one-day games next season. The addition to Stuart Poynter to the Ireland squad for the Zimbabwean leg of the tour is the only other change from the line-up that faced Australia. Ireland will face Zimbabwe in one-day internationals in Harare on 9, 11 and 13 October before taking on Zimbabwe A in a four-day game starting on 17 October. Their Intercontinental Cup match in Namibia will begin on 24 October. Ireland captain William Porterfield says his team will be "well prepared" for the African tour. "It's fantastic that everyone is fit and raring to go," said Porterfield. "We've been involved in some great games with Zimbabwe over the years and I'm certain this series will bring more of the same. "We all remember the World Cup games, with the tie in the West Indies in 2007 and our five-run win in Hobart at the start of the year." Durham player Poynter will not be involved in the InterContinental Cup game. Ireland squad: William Porterfield (Warwickshire) capt, Andrew Balbirnie (Middlesex), George Dockrell (Somerset), Ed Joyce (Sussex), John Mooney (Balbriggan), Tim Murtagh (Middlesex), Andrew McBrine (Donemana), Kevin O'Brien (Railway Union), Niall O'Brien (Leicestershire), Stuart Poynter (Durham), Max Sorensen (The Hills), Paul Stirling (Middlesex), Stuart Thompson (Eglinton), Gary Wilson (Surrey), Craig Young (Bready).